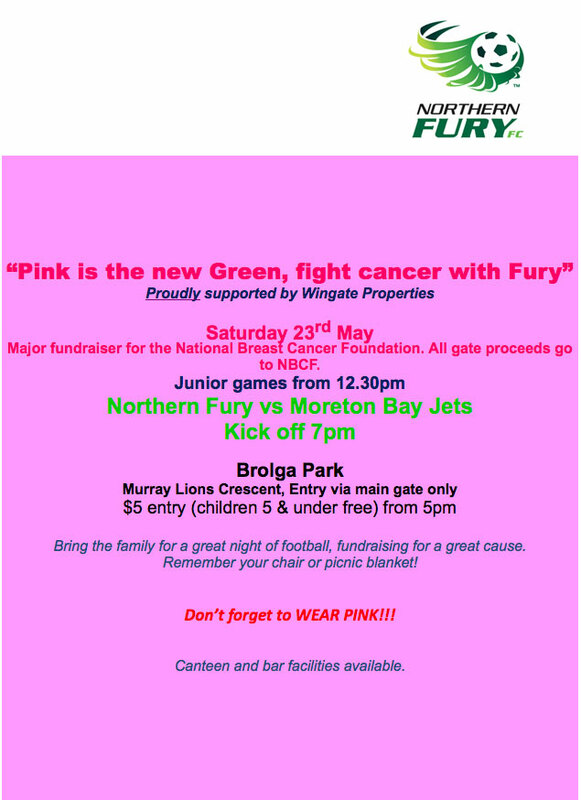 Watch football and raise money for the National Breast Cancer Foundation - “Pink is the new Green, fight cancer with Fury”. Bring the family for a great night of football, fundraising for a great cause. Remember your chair or picnic blanket! And don’t forget to WEAR PINK!!! This event is a major fundraiser for the National Breast Cancer Foundation: All gate proceeds go to NBCF. Junior games are from 12.30pm and the Northern Fury vs Moreton Bay Jets kicks off from 7pm. Entry is $5 from 5pm and children aged five and under are free. Canteen and bar facilities available. Proudly supported by Wingate Properties.